As the links to the recordings of Graham Harman’s talks are scattered around the site in various blog posts, I created a separate page (Graham Harman Audio) where they are all compiled. I’ll also copy them into this post. Listen – 1 hr 45 min recording of Graham Harman’s talk at University College Dublin (UCD), entitled “A New Theory of Substance”, with Dermot Moran as discussant, on 17 April 2009. Listen – 1 hr 47 min recording of Graham Harman’s talk entitled “Assemblages According to Manuel DeLanda” and the discussion at the ANTHEM seminar, London School of Economics and Political Science, on 27 November 2008. Chaired by Peter Erdélyi. 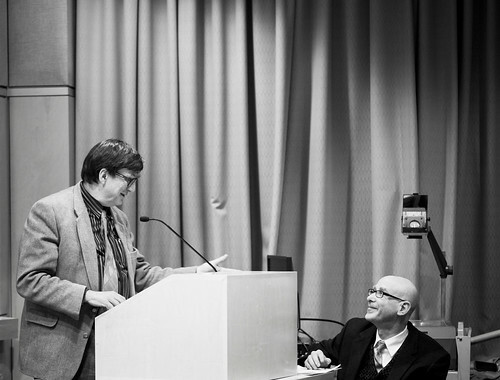 Listen – 3 hrs 24 min recording of “The Harman Review: Bruno Latour’s Empirical Metaphysics” symposium at ISIG, LSE on 5 February 2008. Speakers are Bruno Latour and Graham Harman. The panelists are Lucas Introna and Noortje Marres. The event is introduced by Leslie Willcocks and chaired by Edgar Whitley. There are also audience questions and comments. Listen – 1 hour recording of Graham Harman’s talk, “The Greatness of McLuhan,” on the metaphysics of the ‘tetrad’ of Marshall and Eric McLuhan, at the Media School at Bournemouth University on 4 February 2008. Introduction by Barry Richards and Peter Erdélyi. Listen – 1 hr 15 min recording of Graham Harman’s talk “On the Origin of the Work of Art (atonal remix)” at the Arts Institute at Bournemouth on 1 February 2008. Introduction by Tammy Lu. 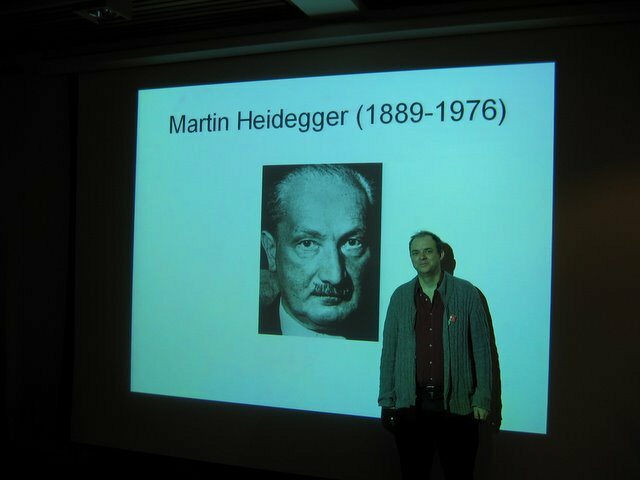 Listen – 1 hr 34 min recording of Graham Harman’s talk “On Actors, Networks, and Plasma: Heidegger vs. Latour vs. Heidegger” at the Information Systems Research Forum, ISIG, LSE on 29 November 2007. Introduction by Aleksi Aaltonen and Peter Erdélyi. Recent decades have seen a dual and simultaneous shift in conflict trends. With the end of the Cold War and superpower support, conflicts have become increasingly intrastate and increasingly localized, dependent for their sustenance upon local assistance and national resources. Yet this localization of conflict has coincided with the increasingly international aspect of conflicts, with humanitarian intervention and UN peacekeeping becoming ever more prevalent. The aim of this paper is to provide a framework for understanding these shifting relations between the global and the local. This is accomplished through an analysis of actor-network theory and its rejoinders to reductionist understandings of conflict. Rather the reducing the eruption of violence down to greed, grievance, or ancient hatred, actor-network theory aims to examine conflict networks and their specific composition of local, material, and global actors. Three aspects of these networks are highlighted in particular: the personal networks of local individuals, the material actors, and the conflict network as a system. With these clarified the final section turns to an analysis of some of the primary modalities through which global actors relate and embed themselves within local networks. Latour, B. (2002). War of the Worlds: What About Peace? Chicago, Prickly Paradigm Press. ﻿﻿Latour, B. and V. A. Lépinay (2009). The Science of Passionate Interests: An Introduction to Gabriel Tarde’s Economic Anthropology. Chicago, Prickly Paradigm Press : Distributed by the University of Chicago Press. Candea, M. ed. (2010). The Social after Gabriel Tarde: Debates and Assessments. London, Routledge. YouTube video: “Networks, Societies, Spheres: Reflections of an Actor-Network Theorist” by Bruno Latour, The International Network Theory Conference, University of Southern California, 19 February 2010. Download PowerPoint slides [PDF]. Hat tip to and more information at Annenberg Networks Network. Looking at the list of accepted papers (RTF file) at the 1st Interdisciplinary Market Studies Workshop coming up in Sweden in June this year, I’m wondering if “explosion” is too hyperbolic a term or just right to describe what seems to be a dramatic increase of interest in the social study of markets these days. Many of the titles appear to be referring to the concept of market devices introduced in the volume edited by Callon, Millo & Muniesa in 2007, who draw on the insights of science and technology studies and actor-network theory for the study of economic phenomena, especially markets. P.S. And there is also of course the After Markets event coming up in Oxford in April, along similar lines, in the tradition of their excellent “Does STS Means Business” series. Check out the provocation piece for this event here (PDF). Posted in Actor-network-theory, Conferences, Economic sociology, Michel Callon, Organization studies, STS | Comments Off on Market studies explosion? You are currently browsing the ANTHEM blog archives for March, 2010.